Isabella: Hi. I'm Isabella Ripa and I'm the main character in The Night The Penningtons Vanished. I have two friends, Vicki Ciconne and Lauren Simmons. We're just average girls. Lauren: I'm not fat. I'm as skinny as a rail. Vicki: And, besides, it's not all about you. What happened happened to all three of us. Isabella: Anyway—it threw us head first into a murder mystery. Vicki: And no one believed one word we said. Isabella: Including my older sister, Anna, who did nothing but complicate matters in the worst way. She tends to be a little on the wild side—if you know what I mean. Isabella: Well, to be perfectly honest, only parts of it were funny. Lauren: None of it was funny. Vicki: If it was such a horrible experience, then why are you so intrigued with Eva? When she asked us to help her, after that fortune-teller predicted her death, you didn't walk away. Isabella: Wait a minute that's the second book in the Isabella Ripa series The Death Of Me. Lauren: That is so unfair. Having a series named after you, when clearly Vicki and I did all the work. Vicki: For once Lauren is right. 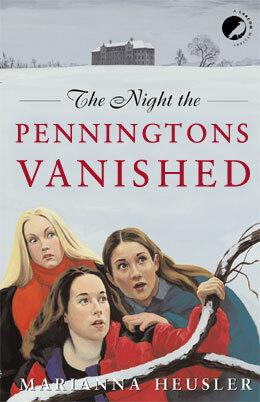 First you have to read The Night The Penningtons Vanished. And now if you'll excuse us, we're going to make some fudge.